Why does my Synology System Health sensor show incorrect CPU and memory values? I monitor my Synology NAS with the Synology System Health sensor. Unfortunately, comparing to the Synology resource monitor interface, both the sensor channels CPU Load and Memory Usage show wrong values while, for example, the temperature is correct. CPU Load usage even exceeds 100% in PRTG. Where do these values come from? Which OIDs does the Synology System Health sensor query to display CPU and memory percentages? Does PRTG some sort of calculation? The way PRTG calculates the memory usage for your Synology device explains potential differences to the memory values you might see in the resource monitor GUI of your Synology. This cannot be changed. For CPU load, please consider the following: Synology reports the 1 minute average load as a dimensionless number and sums up the CPU load of the single cores. So, this means that the maximum load that Synology returns is not 100% but 100% multiplied by the number of CPU cores in the Synology station. Because of this, you can even see CPU load values which are over 100% in PRTG. We cannot adjust the CPU load display of the SNMP Synlogy System Health sensor to adapt automatically to the number of CPU cores because the according information of the Synology device is missing. However, you can change the way the CPU load channel shows the value. With the knowledge from above, you can adjust the display of the CPU load value of your Synology System Health sensor depending on the number of existing CPU cores. So if your Synology NAS has four CPU cores, you can show the percentage of the maximum 100*4 in the channel. Navigate to the Overview tab of your SNMP Synology System Health sensor. 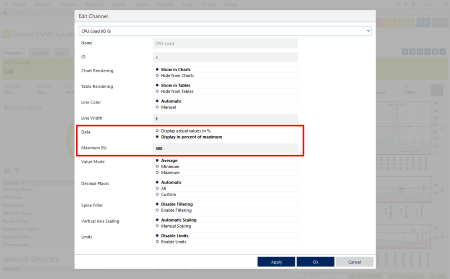 Open the channel settings of the Synology CPU Load channel. The percentage value of the CPU Load channel now matches your Synology CPU load average based on a scale 0 to 4 cores being 0 to 100% CPU load. Synology (among many other linux operating systems) uses memory for disk caching, and the PRTG Sensor's Available Memory is taken from the Free memory listed on your Synology Device. You can check this by going to your Synology's UI, Main Menu, Resource Monitor, Performance, and Memory (tab). As for the CPU, I don't think the Synology UI accurately reports the CPU usage. At first glance, the divide by 4 method still reported CPU usage much higher than the Synology's resource monitor reports right on the landing page of the Synology UI. In actuality, the CPU usage seems to fluctuate when idle a lot. I do agree with setting the max to 400% unless you just want to read that info as total processing power, but if you ssh into your Synology and run htop, you get a much more detailed report of CPU usage per core. I was satisfied with the prtg sensor after seeing this.